surrounded by green paddy fields and river Cauvery flowing through, Ganapathy Agraharam is small village and abode of Sri Maha Ganapathy. As per the legend this place during several centuries ago was dry land affected by drought. Gauthama maharishi , husband of Akalya left his ashram (after Akalya was turned into a stone due to curse) and was travelling through this village. The people of the village seeing this Gautamar maharishi realised that he must be their saviour and pleaded to him to invoke the rain God and make the land fertile. Gauthamar wondered for the reason of such a drought and he sensed that a Ganapathy consecerated by Maharishi Agastya was buried in the soil. He asked the people of the village to search for that idol. Before dusk the idol was brought out and Gauthamar appeased Lord Ganapathy with sadatchara mantra. Soon rain clouds formed and the village received a copious rain fall. River God Cauvery diverted herself through that village to have the darshan of Maha Ganapathy and continued her journey through that village. The village became fertile. 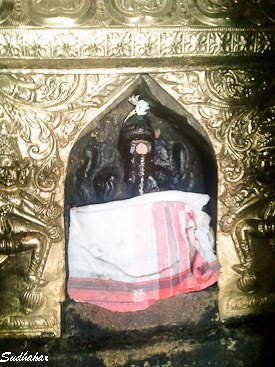 As the village prospered because of Maha Ganapathy, it was then named as Ganapathy Agraharam. The temple itself is small and beautiful. As you pass through the colourful main corridor you come across the Dwajasthambam. You can have a darshan of a small carved image of ganapathy in the dwajasthambam. Inside towards the left of the main entrance to sanctum sanctorum, a large painting of Kanchi maha periyaval welcomes us. Ganesha purana are depicted on the walls. The Maha Ganapathy inside the sanctum sanctorum is around 5 feet high sitting majestically in a beautifully carved pedestal. His vahana ( carrier) mooshika ( rat) sits in a praying posture. His trunk is curved towards right and is known as Valampuri. During Tuesdays, Fridays and chaturthis the idol is adorned with silver kavacham and beautiful jewels. There are many beautiful paitings around the praharam walls. To the south east of the temple is a small nandavanam(garden) with pupil and neem tree as the sthala vriksham. The people of this village are so devoted to Maha Ganapathy that they gather on this temple on Ganesh Chaturthi day and they collectively celeberate the festival at the temple and offer the sweets and modaks instead of celeberating in their homes. Temple Festivals Ganesha Chaturthi is celebertaed very elaborately at this temple. Annual 'pavitrovatsam' , monthly chaturthi pooja are celeberated in a grand manner. 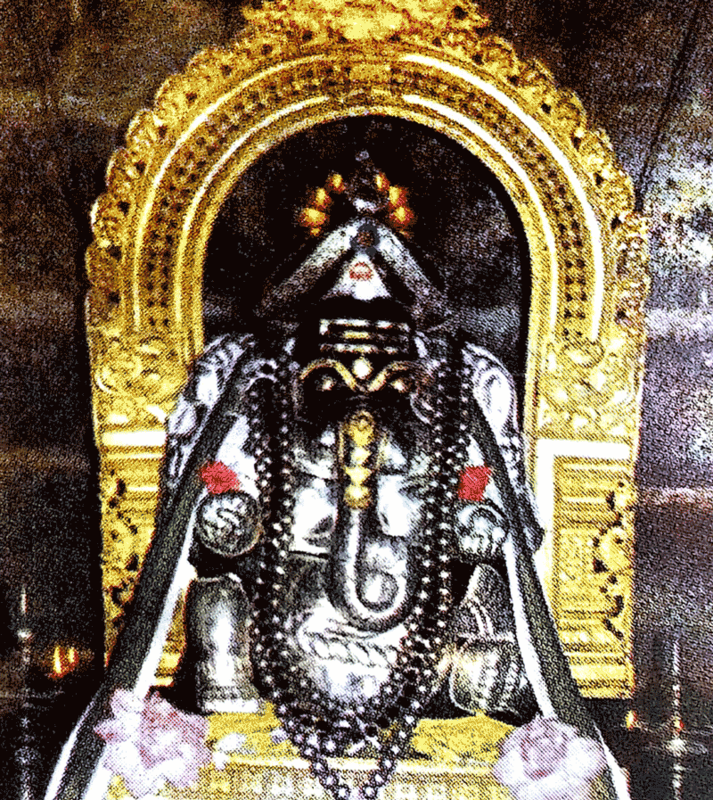 Temple location Ganapathy Agraharam is around 25 kms away from Kumbakonam town. How to reach? There are bus services from Kumbakaonam. Autos are economical and charge within Rs 250 for a round trip from Kumbakonam. ( be preapred to shell out waiting charges ). If you drive your own car , it is a very scenic drive from Kumbakonam town. Where to Stay?There are no hotels in Ganapathy Agraharam itself, but I would recommend the hotels in Kumbakonam. There are several budget hotels and deluxe hotels in Kumbakonam. Other interesting places around Ganapathy Agraharam Kabisthalam, one of the 108 divya desams, Murugan temple in Swamimalai, Tiruvayaru are nearby.